Born and raised in Havana, Grammy nominated pianist and composer Manuel Valera since arriving in NYC has become well known in the modern jazz scene, garnering national reviews and lending his talents as a pianist and composer to such notable artists as Arturo Sandoval, Paquito D’Rivera, Brian Lynch, Dafnis Prieto, Jazz at Lincoln Center Orchestra, Jeff “Tain” Watts, Chris Potter, Dave Binney, Adam Rogers, Mark Turner, John Benitez, Samuel Torres, Joel Frahm, Yosvany Terry and Pedro Martinez and classical violinist and composer Joshua Bell among many others. This dynamic and prolific artist has recorded 12 cds as a bandleader with touring projects ranging from his Grammy nominated group New Cuban Express to his modern contemporary trio to solo piano. His latest trio recording The Seasons will be released on MAVO Records spring 2017. 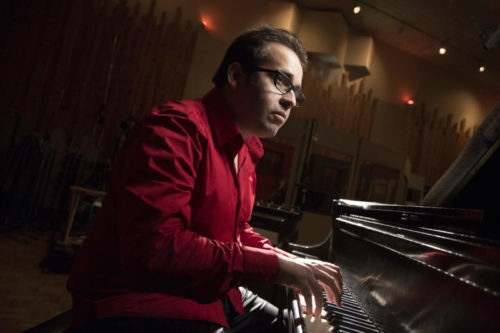 Valera is the recipient of many composition grants — most notably Chamber Music America’s New Jazz Works, the Dranoff International 2 Piano Foundation and the ASCAP Young Jazz Composer Award. He has travelled the world performing in more than 30 countries at some of the biggest international venues and festivals in the world.